Mother Nature is an extraordinarily skilled sculptor, an artist that no human can hope to match. She paints skies with dazzling colors and whittles away immense cave systems to form strange cathedrals. Her tools—the wind, sun, rain, river systems—all work in seamless strokes to create masterpieces that enchant even the most unimaginative individual. And we, as Filipinos, are fortunate that we have one of these masterpieces right in our very own country. 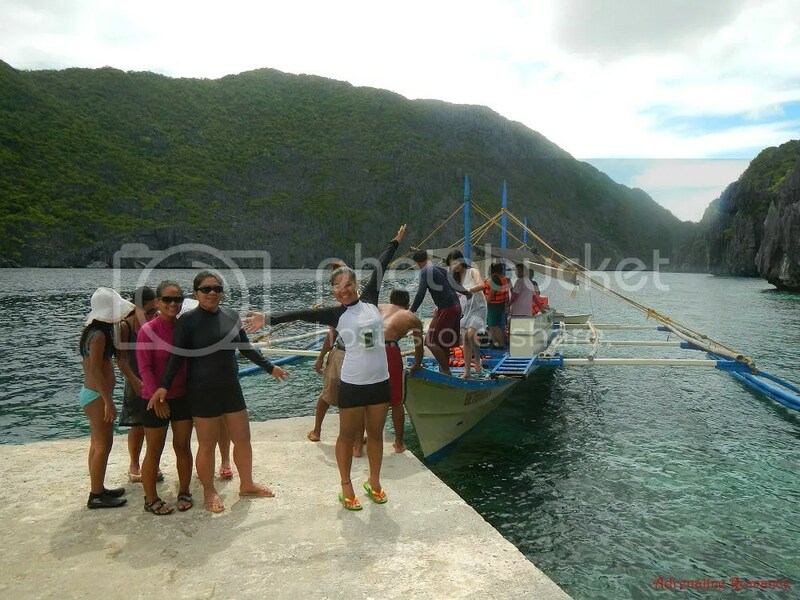 After our warm-up tour around Punta Princesa, it was time to head to the main event and the real celebration of Team Sweetie’s 2nd year anniversary, an island hopping adventure around the archipelago of Bacuit Bay in El Nido, Palawan. 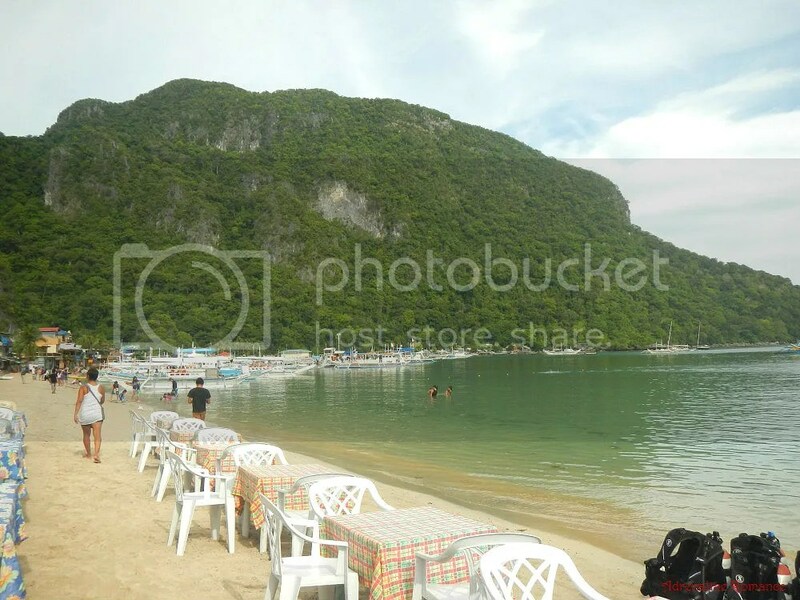 El Nido, a first class municipality in Palawan 238 miles away from Puerto Princesa, is dubbed by CNNGo as the Best Beach and Island Destination in the country. 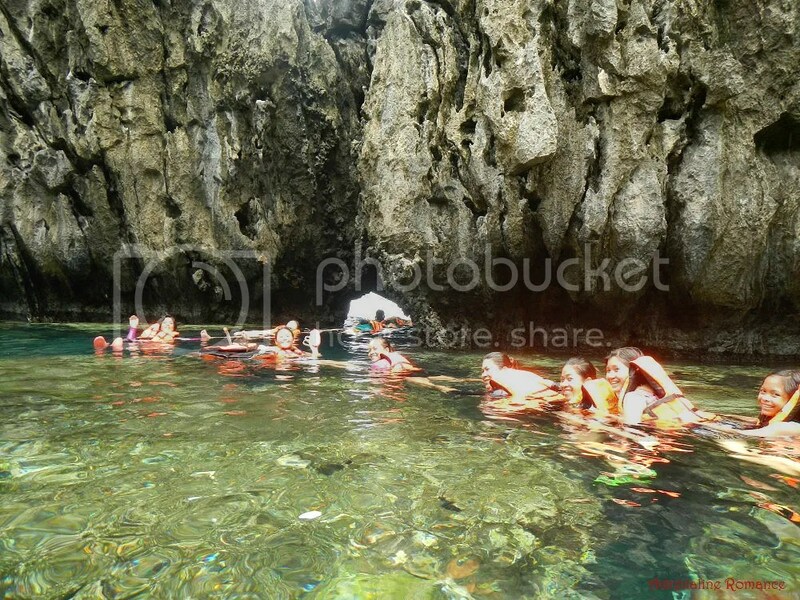 The place is known for its extraordinary natural beauty, amazing geological formations, and its rich ecosystem. We woke up at 1AM and were on the road 30 minutes later. It was actually the earliest time we ever traveled, so most of us were still in dreamland. 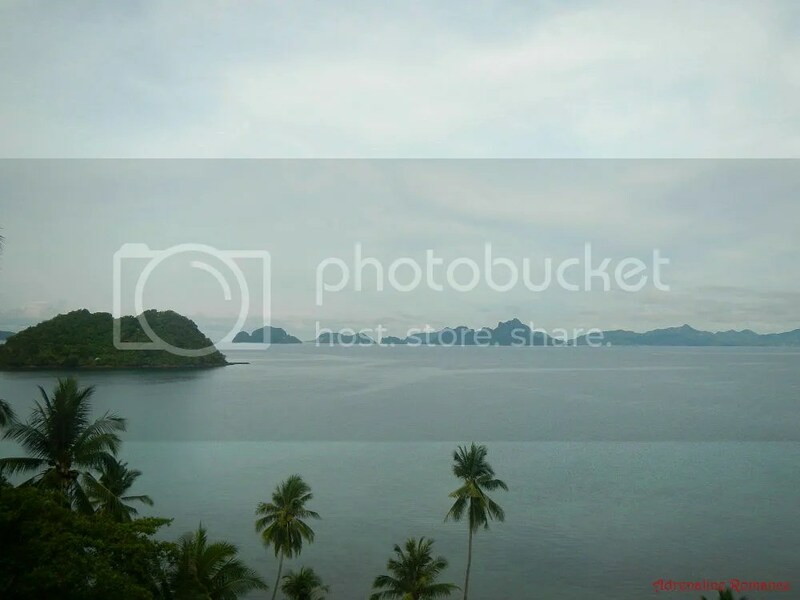 You see, El Nido is a 5-hour drive from Puerto Princesa; and to start the island hopping adventure at 8AM as per our itinerary, we need to be in El Nido early. 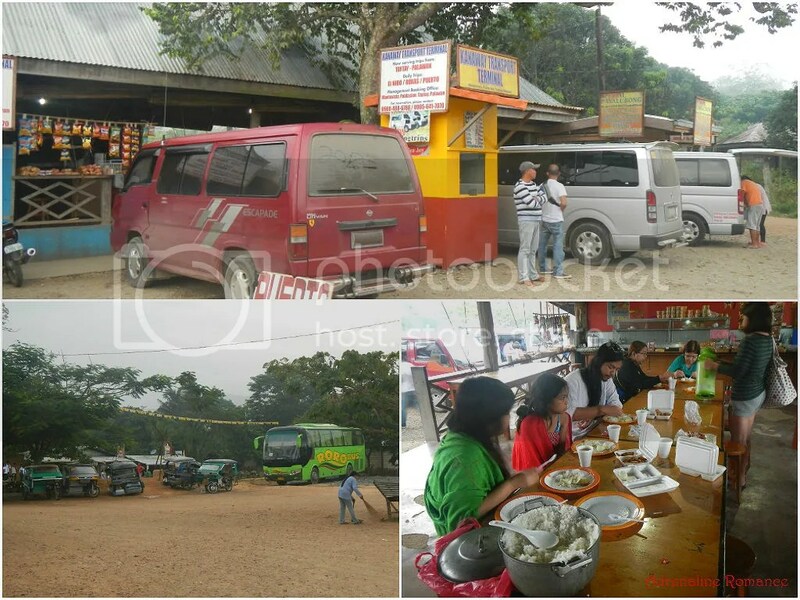 At around 5:30AM, we reached the bus terminal in the northern municipality of Taytay where we ate a hot breakfast courtesy of Victoria Guest House and Cottages. The filling breakfast and steaming coffee shook off the drowsiness in us. After breakfast, we were on the road again. 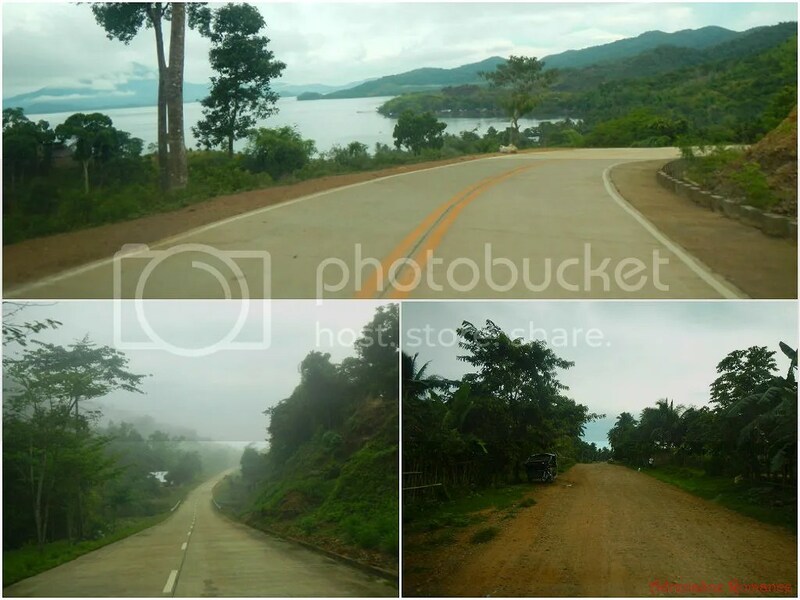 This time though, with the drowsiness drowned in coffee, we were able to appreciate the lovely countryside views around us. 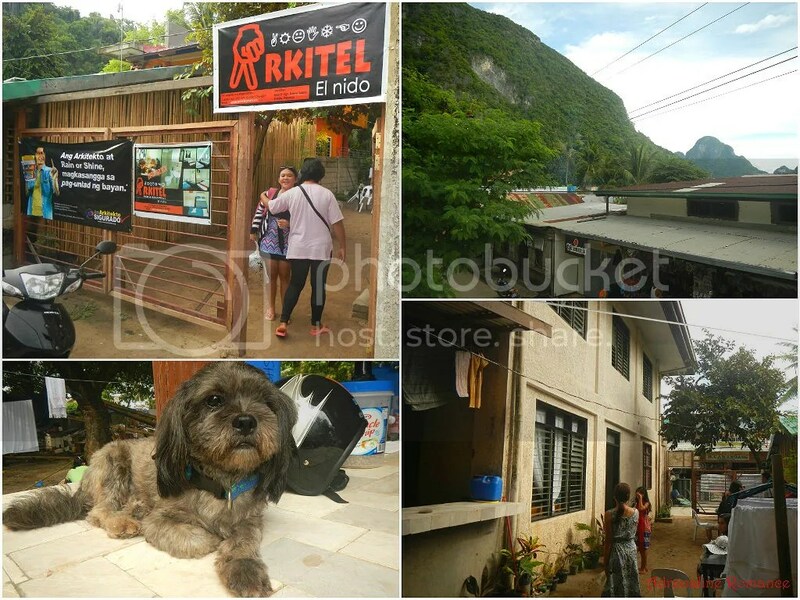 El Nido was still more than an hour away, and we traveled over miles of alternating asphalted roads and dirt roads. 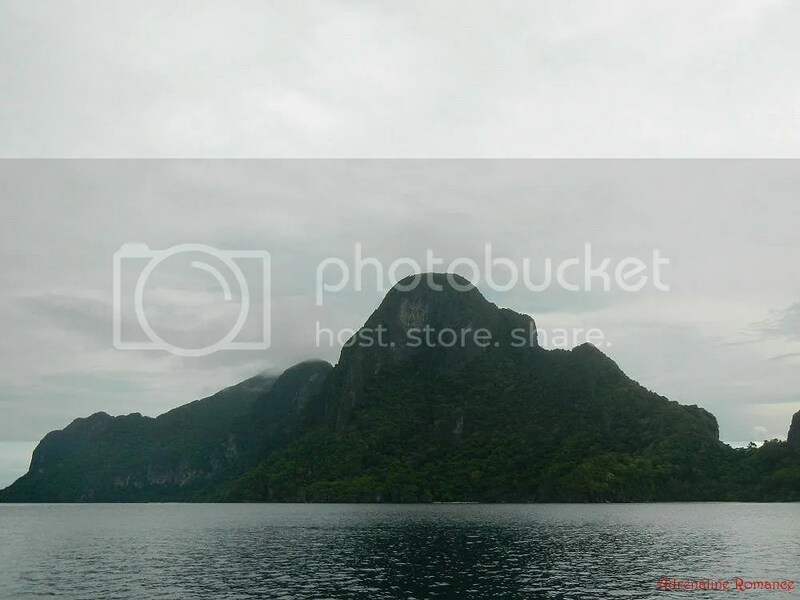 A little over an hour, our guide ate Helen suddenly blurted out, “We’re here!” Indeed, from the coastal road, we could see the gorgeous Bacuit Bay where the magnificent limestone islands of El Nido are nestled. 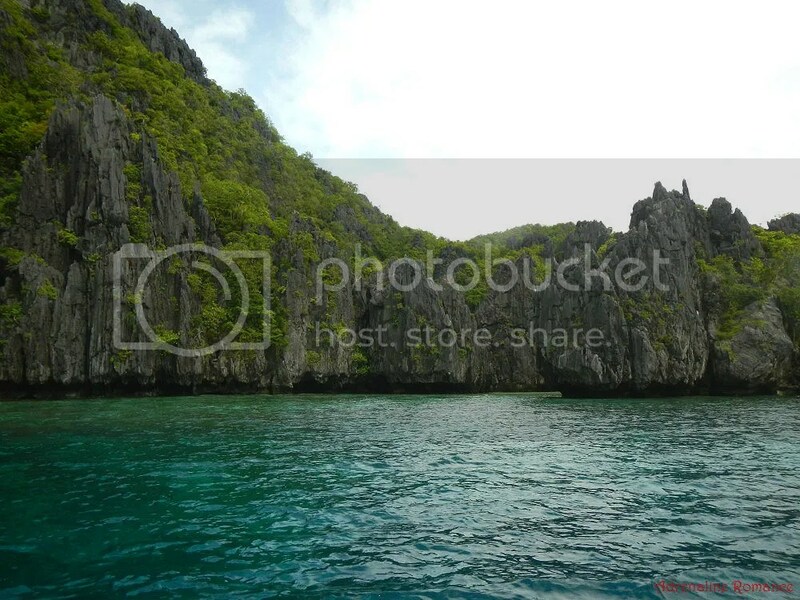 As natural, protective walls, these limestone cliffs form an imposing border on the east side of the El Nido Poblacion. 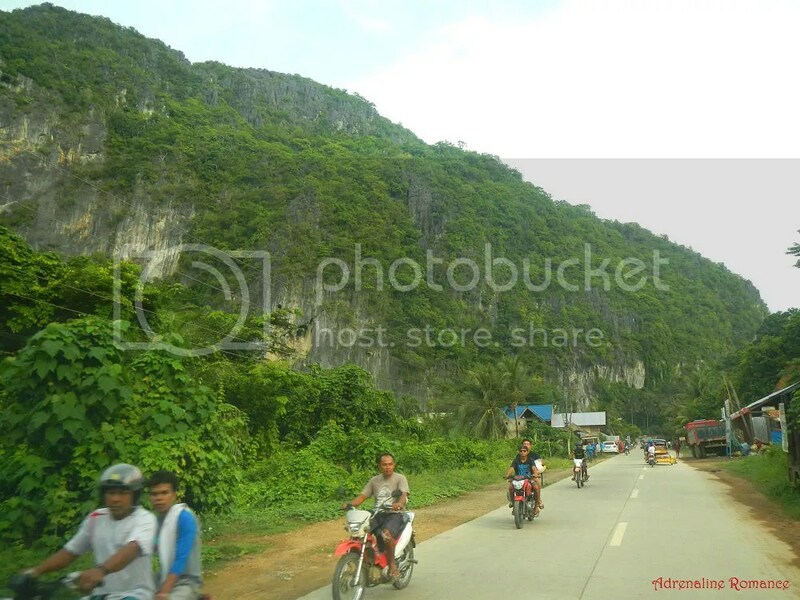 These limestone cliffs are breathtakingly immense and are perfect venues for rock climbing. At around 7AM, we arrived at the newly opened Arkitel Bed and Breakfast, which was our designated accommodation. It was a really humble, homey, friendly place, guarded by a cute Shih Tzu named Bullet. The B&B also has a nice terrace where guests can relax, have a drink, and chat while lazily watching the world go by on the street below. We left our packs in our respective rooms and hurriedly headed out to the beach, which was just a 5-minute walk from Arkitel. A gorgeous crescent public beach of fine sand bordered by high limestone cliffs welcomed us as we emerged from an alley. Having breakfast here would be awesome! Also, the sea was so calm and so inviting that I simply jumped into the water. 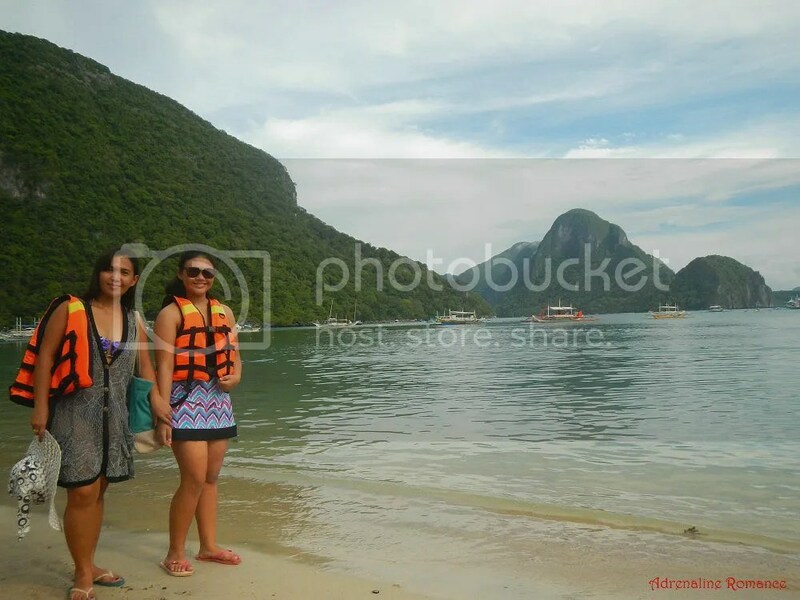 Sweetie and Alexa, along with the others, enjoyed the view of Bacuit Bay while waiting for our assigned boat. It was still quite early; island hopping trips usually start at 9AM. We were at the beach around 8AM. After awhile, ate Helen called us. It was time to board our assigned boat. 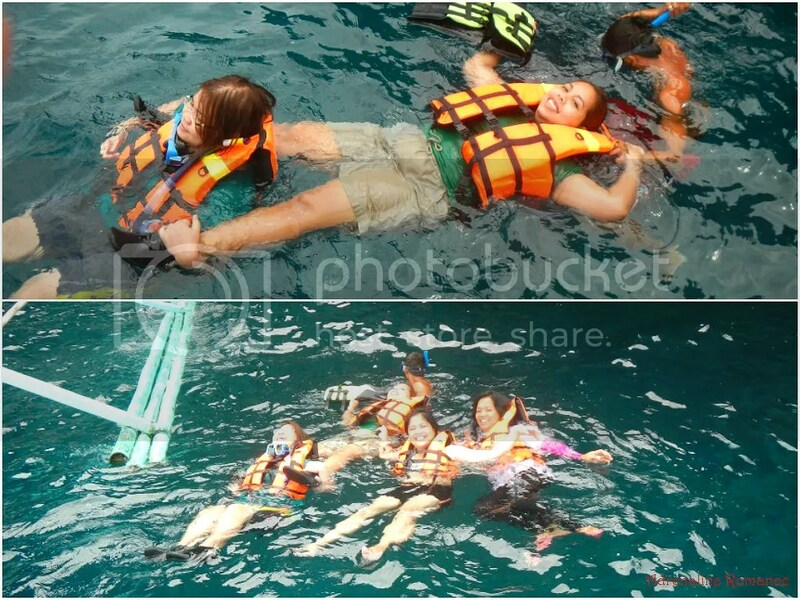 Everyone was pretty excited to get this island hopping adventure going. As we cast off, our guide Gilbert explained our itinerary, schedule, the destinations we are about to visit, and safety rules. We’ve been to many island hopping adventures before, but this was actually the first time we experienced having a comprehensive briefing. That is actually a good practice. 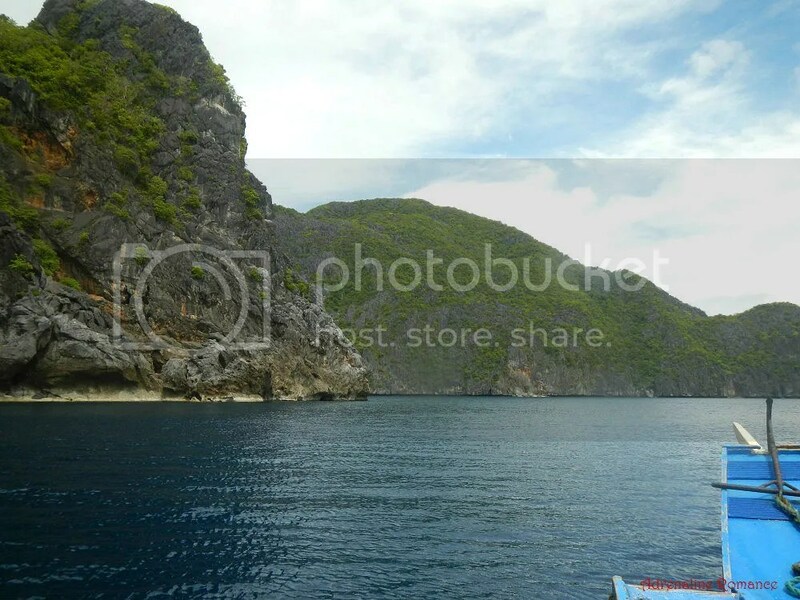 On our way to our first destination, we passed by Cadlao Island. 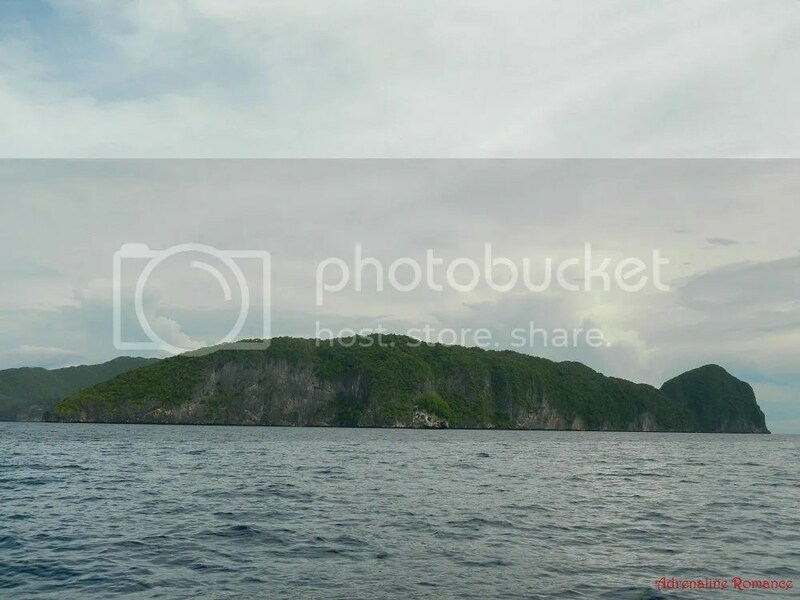 At 10.06 square kilometers, it is the largest island in the Bacuit Bay archipelago and the closest to the mainland. 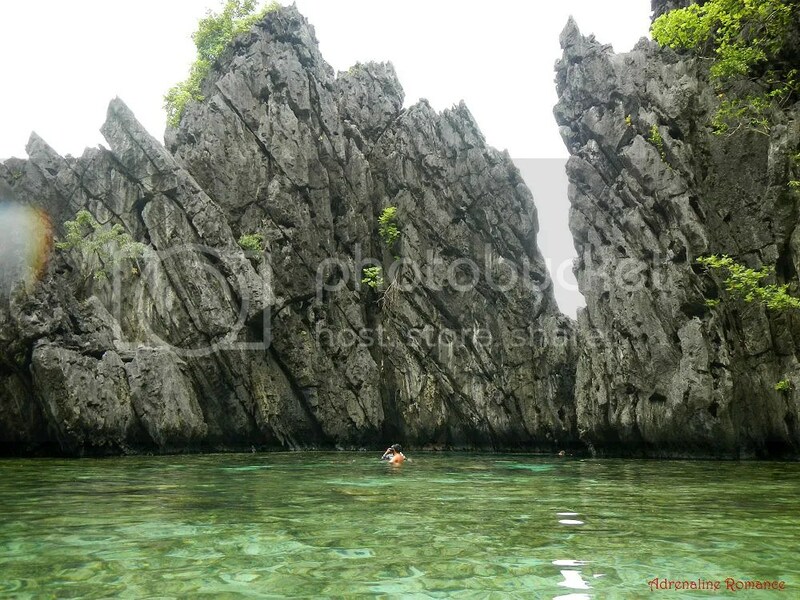 Its karst limestone peak, with a height of 640 meters above sea level, is also the highest in the bay’s islands. Cadlao Island has white-sand shores, hidden lagoons, coral-crusted reefs, mysterious caves, lush forests, and towering cliffs. 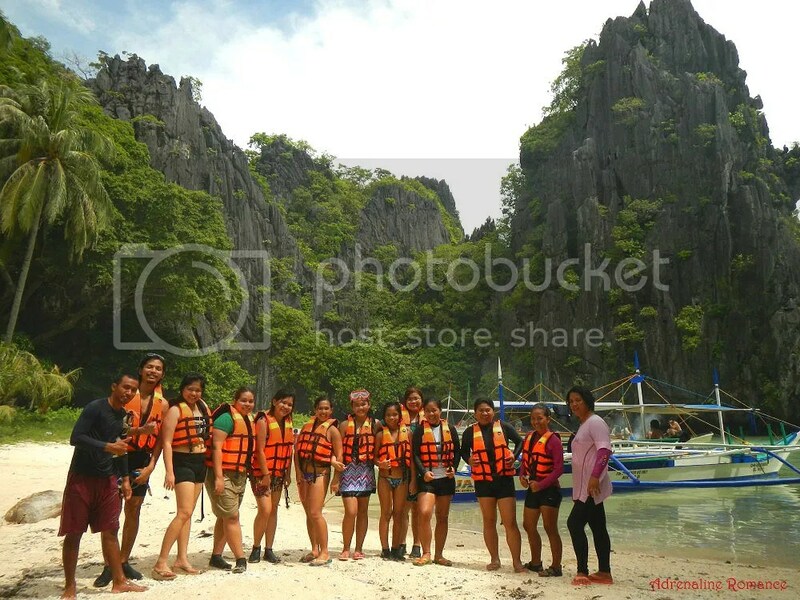 Many tour operators in El Nido actually provide special packages for adventures within Cadlao Island. 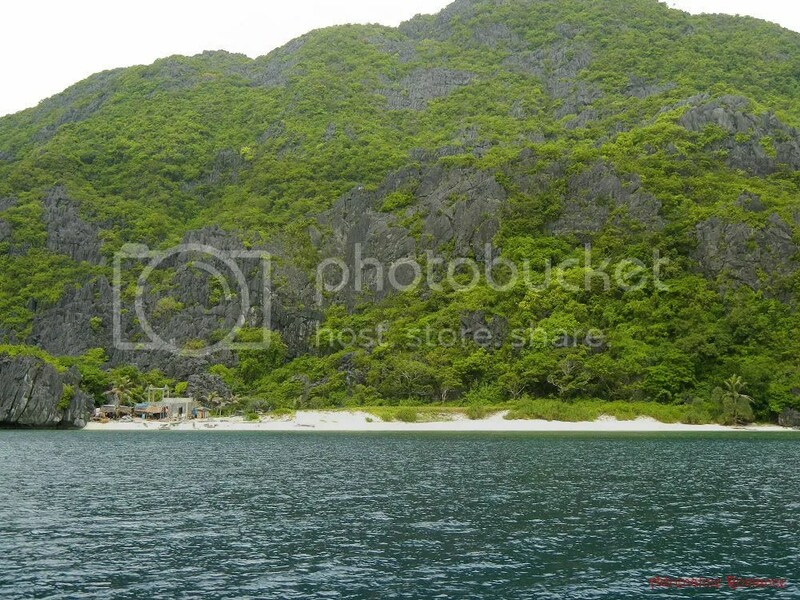 Those are just some of the 45 lush and lovely islands and islets within Bacuit Bay. Each of these islands has its unique features, characteristics, and geological formations. Millions of years ago, these islands were all underwater. Our first destination of the day was a popular yet secluded getaway called Helicopter Island, named so because it looks like a helicopter when viewed from the east. Check out the photo below; does it resemble a helicopter to you? The smooth and relaxing boat ride to Helicopter Island took a little over 15 minutes. When we got there, everyone excitedly dug in their feet in the fine, golden sand. We would love to wake up, have breakfast, and simply enjoy life in a beach like this! The “tail” of Helicopter Island comprises of this enormous limestone cliff. Yes, you know what we’re thinking: what a perfect venue for rock climbing! Problem is, there’s no belay area. Similar cliffs in the islands are home to swifts, gulls, bats, and other marine birds. After getting our masks, we ventured out into Helicopter Island’s snorkeling area, which was safely cordoned off with buoys. 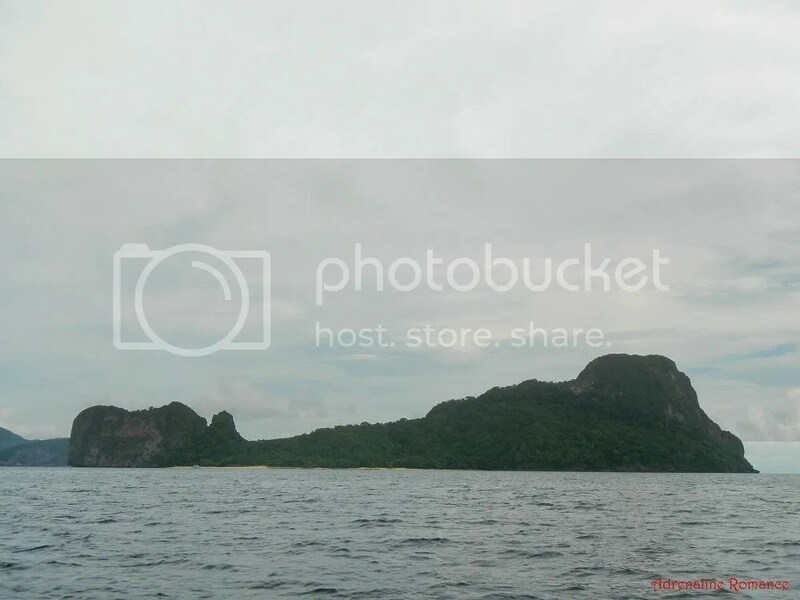 El Nido has some of the best snorkeling areas in the Philippines, and Helicopter Island’s reef definitely proves this. Just 10 to 15 yards from the shore, we were treated to an extraordinary display of beautiful, virgin corals. 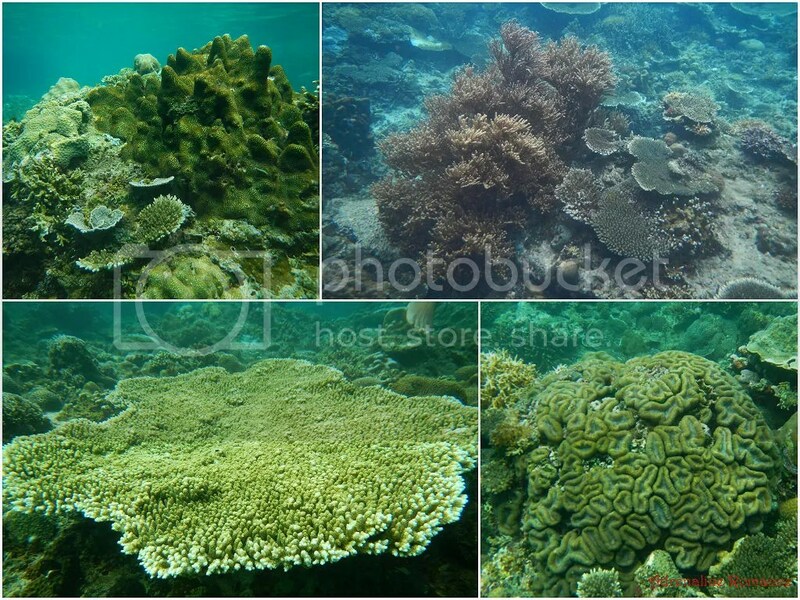 Just look at that incalculably rich variety of corals! And to think that this coral forest is just less than 10 feet below us! 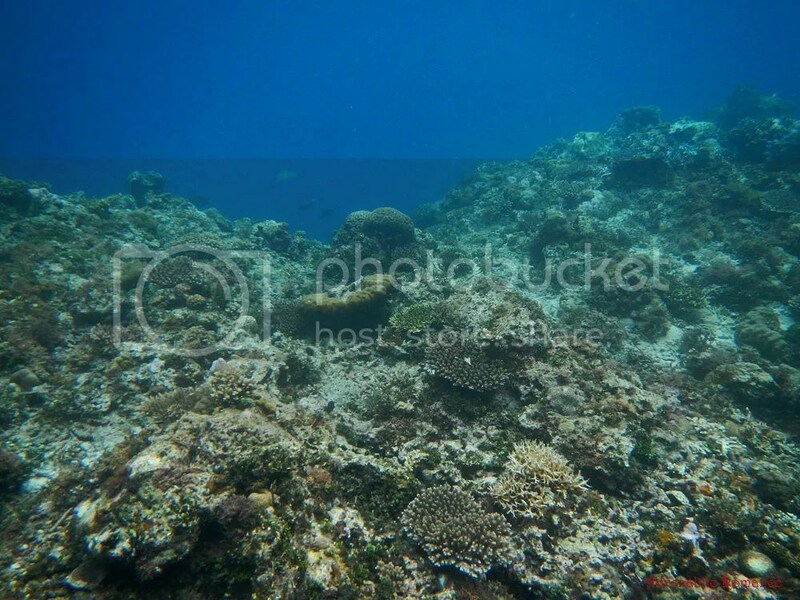 Compare that to the Kontiki dive site; the coral-rich areas are 30 feet or more below sea level. After we had enough of snorkeling, we cruised to our next destination, a place called Hidden Beach. On the way, we passed by this interesting island, which appears like the hump of a monstrous whale. As a Star Wars fan, though, it looks like the wreck of a Rebel troop transport. Beyond that “Rebel troop transport” was a large island where hidden beach is located. Do you know where it is? 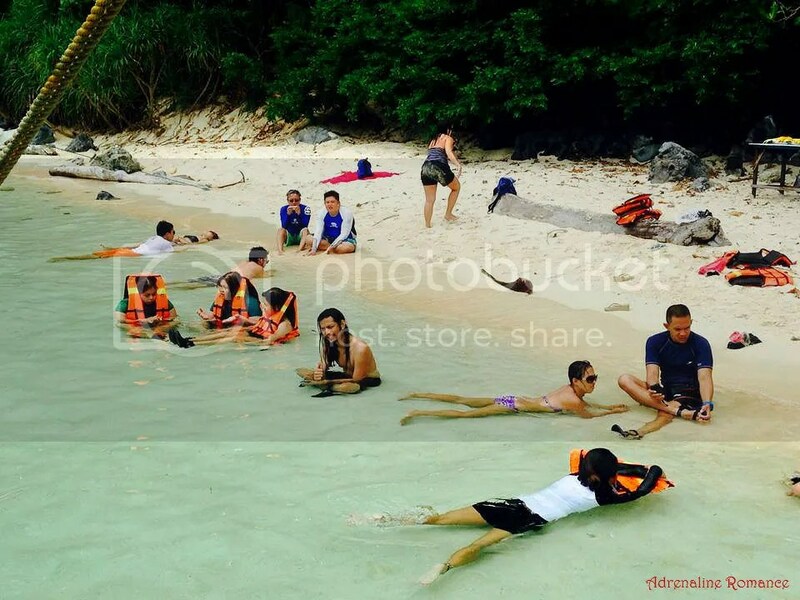 Island hopping guides usually quiz their guests about the location of Hidden Beach. Clue: it’s not in that immense cave. It’s actually a little bit to the side of the cave, its narrow channel hidden by a forest of rock outcroppings. No wonder it is called Hidden Beach; you can’t see it head-on. Shhh! Don’t tell anyone we told you where it is. Between the sharp rock outcroppings is the boat entrance to Hidden Beach. Well, we had the option to take that entrance. However, we wanted to visit Hidden Beach via a more unique entrance. That unique entrance is a small hole that Mother Nature carved out of the side of a cliff. According to the guide, this hole is covered with water during high tide. Be careful and watch your head as you enter the hole. At the other side of the hole is a very tranquil white-sand beach protected by soaring limestone cliffs that were formed by erosion. This place truly deserves its name! Those boats docked on the shore entered Hidden Beach via the narrow channel. See that crevice carved from that wall of rock? That’s where we came from. We frolicked in the clear, clean water of Hidden Beach, which was surprisingly warm. 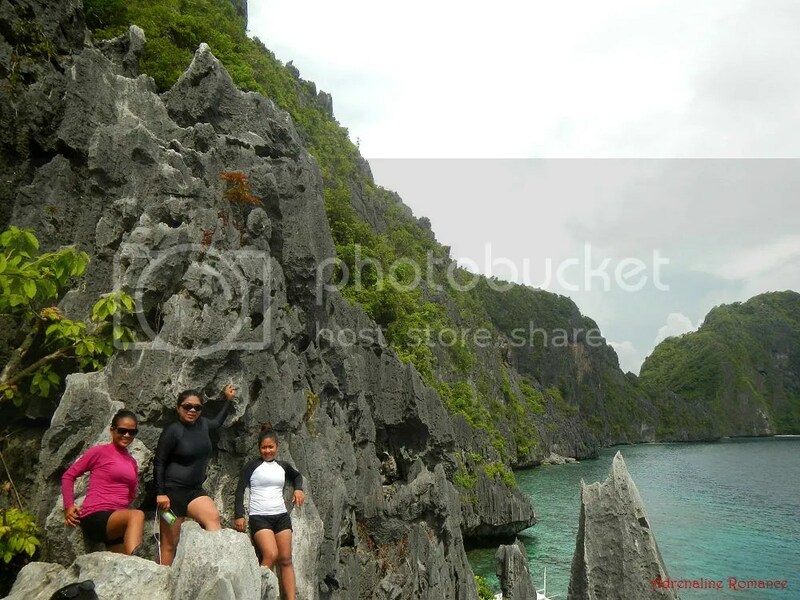 We felt safe, secure, and loved after seeing those razor-sharp cliffs embracing the lagoon. We would have wanted to stay for an hour or so in the Hidden Beach. However, we had to go back to the boat after half an hour since we still have lots of destinations to cover. Going back to the boat is easy; we only had to wade (or swim) through that cliff-bordered channel. Our next destination was almost 45 minutes away from Hidden Beach. 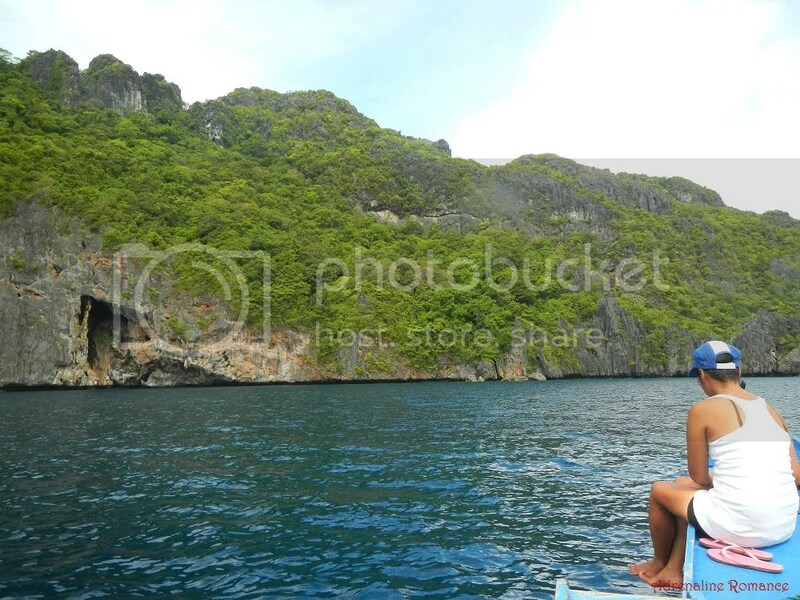 Along the way, we quietly admired the beauty of Bacuit Bay. 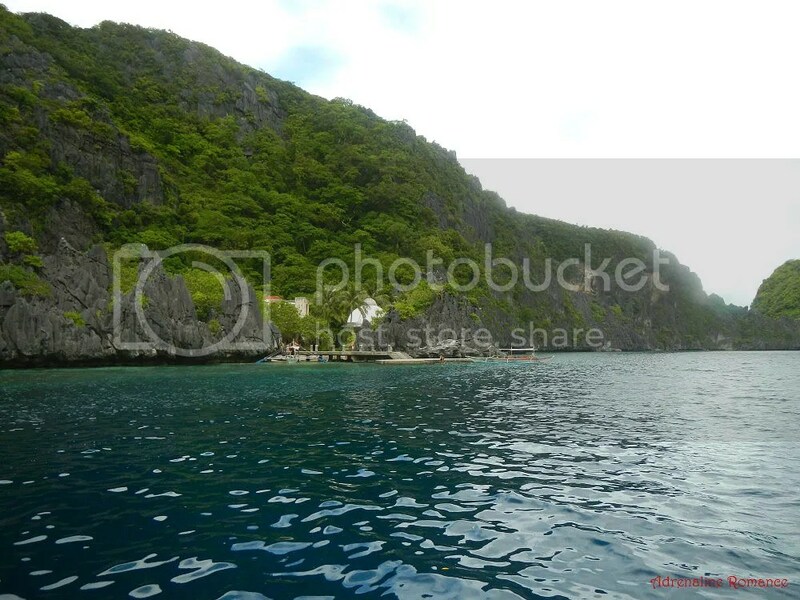 Aside from the magnificent karst cliffs of the island, Bacuit Bay also teems with marine life. 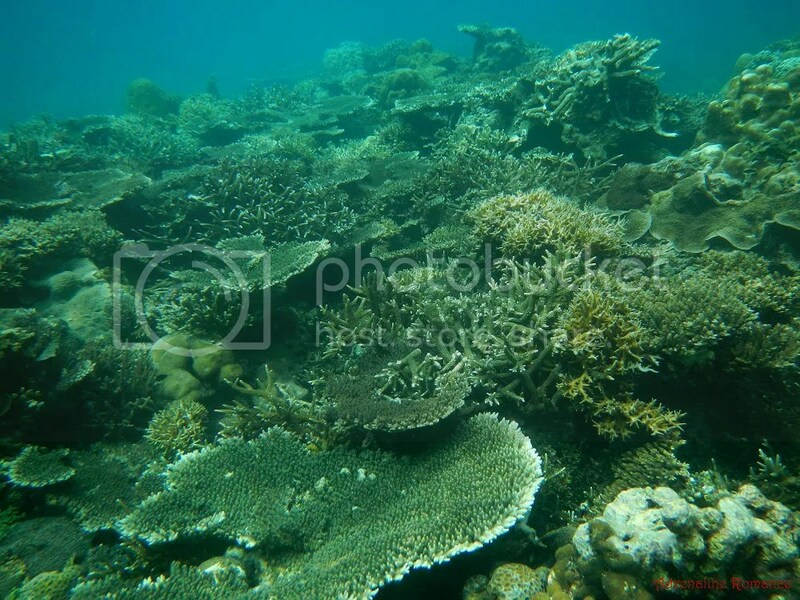 Under the water surface is a rich alien world kingdom of graceful manta rays, massive dugongs, numerous species of fish, vast coral reefs, and rare sea turtles. 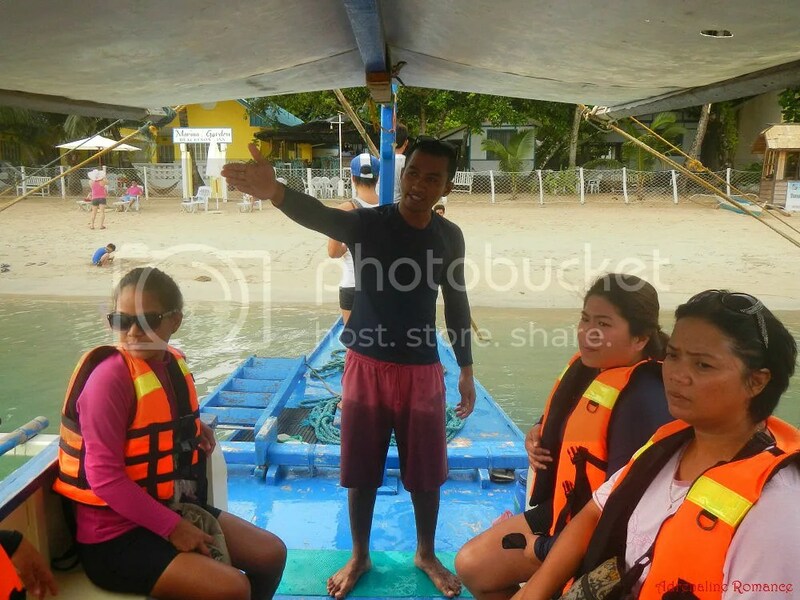 According to the guide, Gilbert, there are more than 30 dive sites in Bacuit Bay, which range from 15 feet to more than 100 feet in depth. 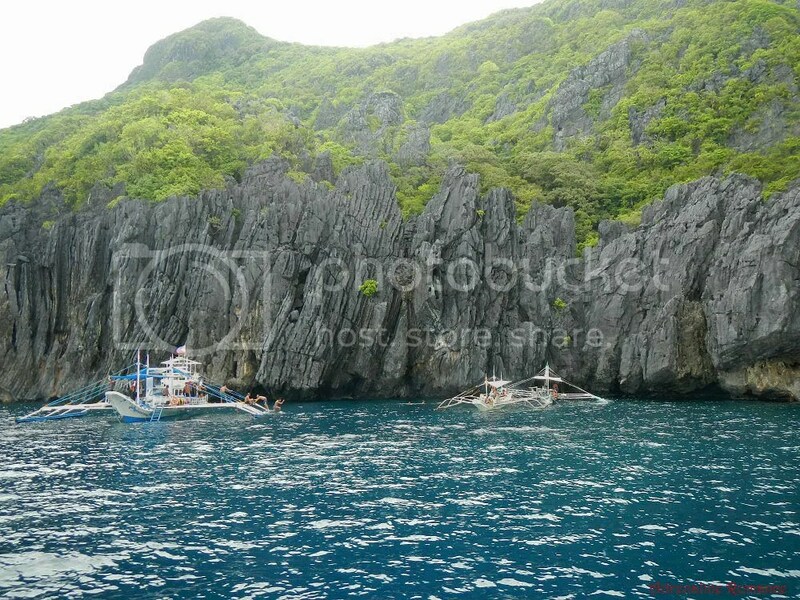 Rough limestone cliffs make up most of the geography of the islands in Bacuit Bay. However, many of these islands have short strips of beaches that are carpeted with immaculate, white, fine sand. Many of these beaches are turned into first-class resorts or inhabited by local fishermen. Finally, we reached . . . a limestone wall? Where’s the beach? The only indication that there was something going on in there was a fleet of outrigger boats docked right in front of the wall. As we got closer, we finally saw what the fuzz was all about. It was a small hole naturally carved from that immense sea cliff. To access Secret Beach, we need to swim through that hole. The water leading to the hole was quite deep, around 20 to 30 feet. Furthermore, a relatively strong current pushed us towards the hole. Donning a life jacket, even if you’re a strong swimmer, is recommended for safety. The hole that we saw at the surface was just the proverbial tip of the iceberg. The rest of the hole, which was submerged, looked definitely both foreboding and awesome underwater. Upon reaching the other side of the hole, we were treated to a hidden paradise that was so perfect it was utterly otherworldly in its beauty. 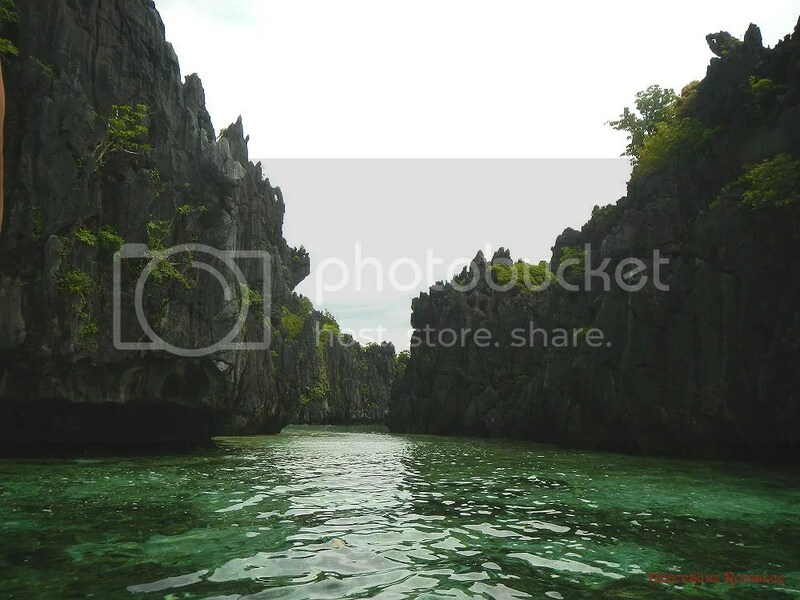 Towering, razor-sharp cliffs conceal a lagoon with liquid that is so clear that it can’t merely be seawater! 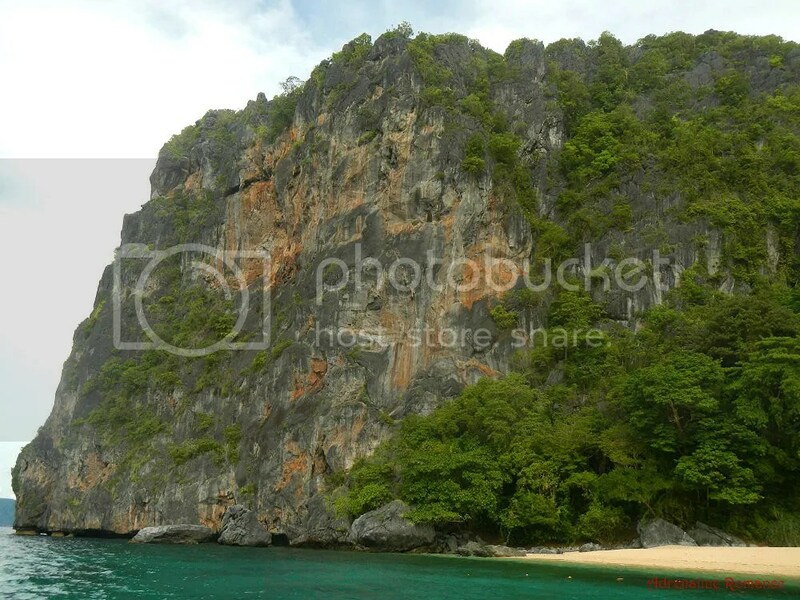 The beauty of Secret Beach inspired Alex Garland to write his famous novel The Beach, who was, at that time, vacationing in El Nido. The Beach was later made into a movie which starred the famous heartthrob Leonardo de Caprio. 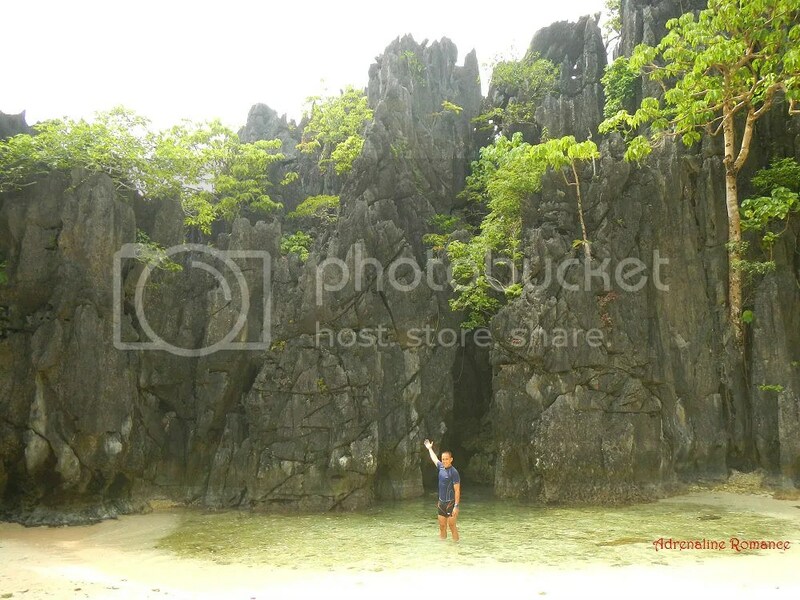 The other side of Secret Beach is a small sandy beach dotted with rock outcroppings. Even though it was close to noon, the air inside this secluded lagoon was quite chilly. Air that was cooled by the sea is trapped within the walls of the lagoon. See how clear the water is? That huge rock looks like it’s just a foot or two under the water’s surface. In reality, that rock rests around 6 to 10 feet underwater! After we had our fill playing in the lagoon, it was time to get back to the boat. And—-our tummies were grumbling. Just 10 minutes away from Secret Beach, we reached a small, secluded area of white sand nestled between two large rock outcroppings. We have reached the simple yet pretty Star Beach. This is where guides and boatmen usually take their guests to have lunch. 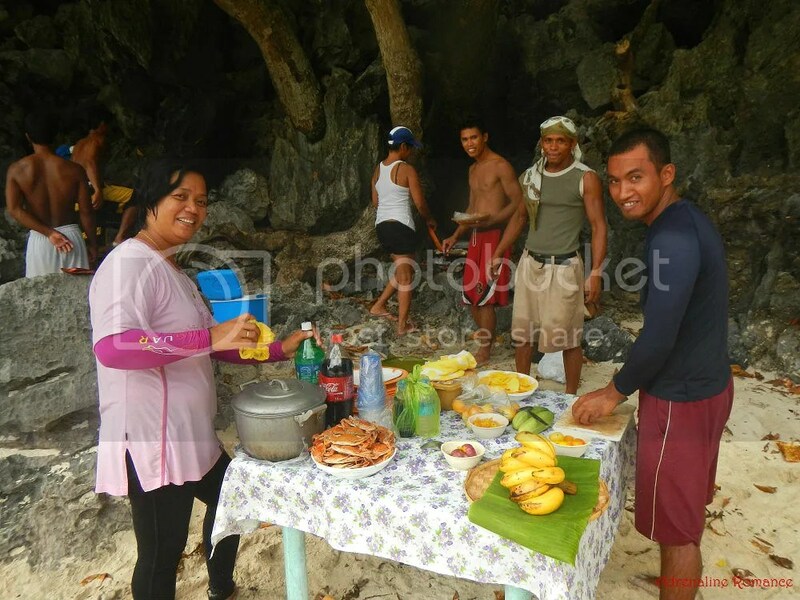 Ate Helen, Guide Gilbert, and our boatmen wasted no time in preparing a sumptuous meal for us. 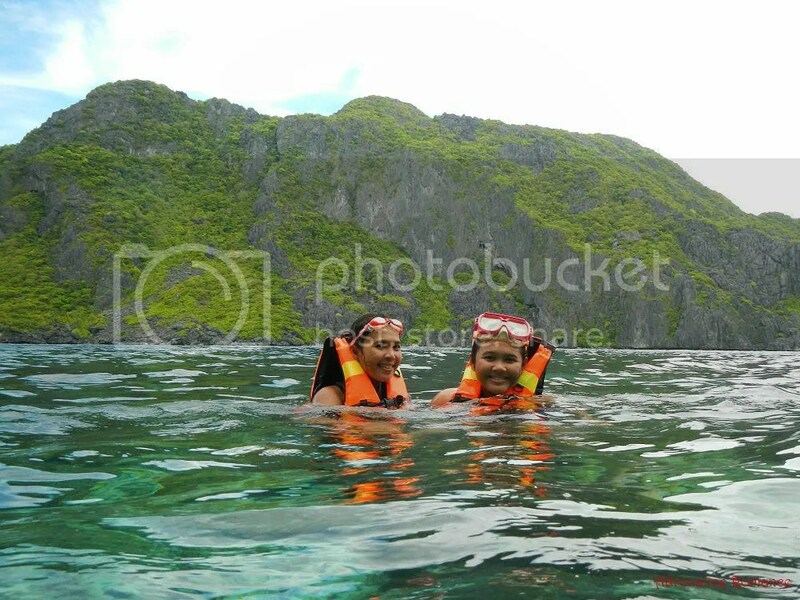 Now, this was truly one of the highlights in our El Nido trip. Our lunch was truly an unexpected surprise. You’ll see why in awhile. Ahh, this is definitely the life! While waiting for lunch, we chatted, laughed, and relaxed. Lunch took longer to prepare than expected, so Sweetie, Alexa, and I decided to explore the kantil that was just a few yards away from the shore. 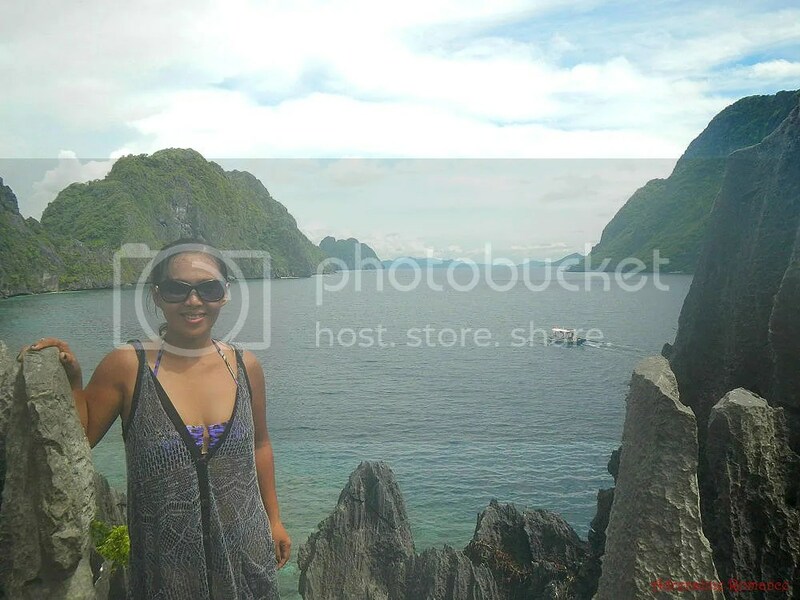 Check out those awesome limestone cliffs in the background. According to guide Gilbert, Star Beach is officially NOT a snorkeling site. But it should be! Just check out that rich coral field at the edge of the kantil. 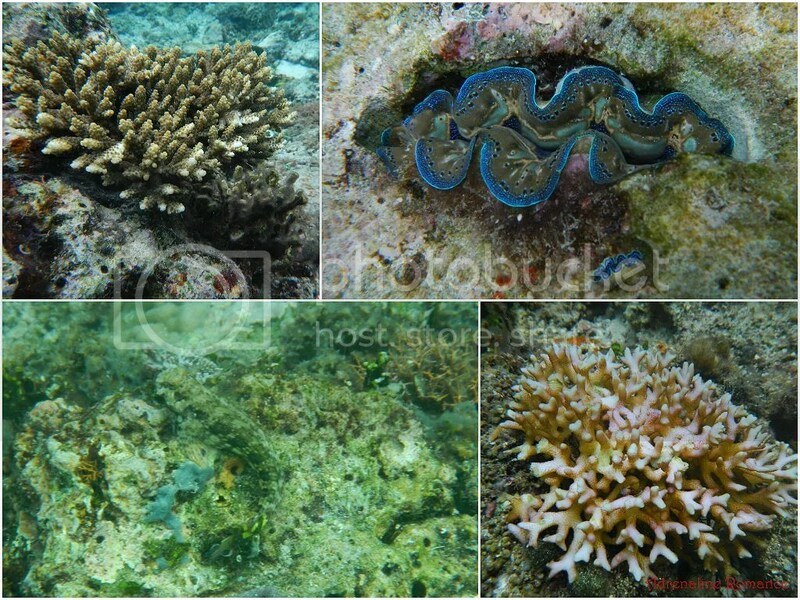 All kinds of corals, fish, and other organisms make Star Beach’s “in-house” reef incredibly vibrant. We actually saw the mantle of a live clam imbedded in a rock. This was the first time I’ve ever seen a clam in the wild since I was 8 years old. After an hour, ate Helen announced that lunch is ready. Lunch was an understatement! They prepared a feast! 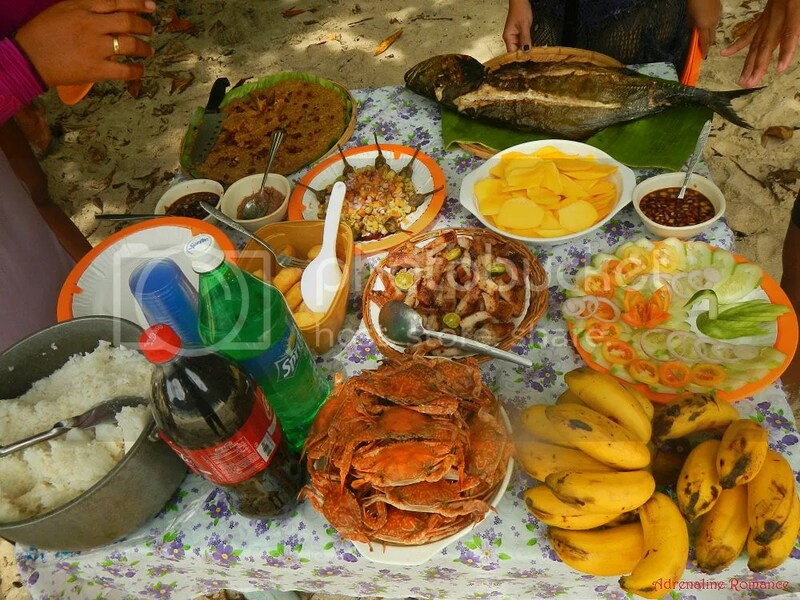 Delicious, mouthwatering boiled crabs, grilled fish, grilled pork belly, eggplant and tomatoes, mangoes with bagoong, biko (glutinous rice cooked in sugar and coconut milk), and fruits were all displayed on our picnic table with culinary splendor. Just check out that vegetable salad at the right side of the photo! It comes complete with a swan carved out of a cucumber! 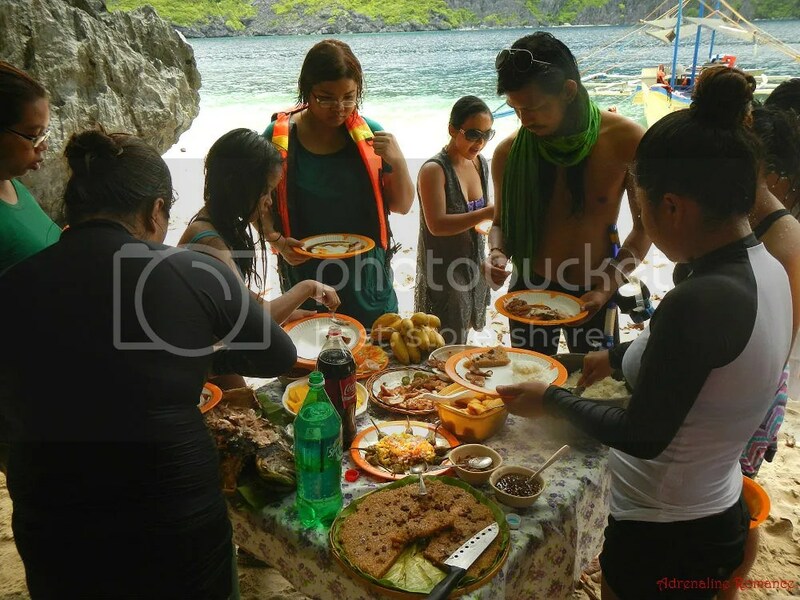 After a short prayer, it was time to attack the table Pinoy picnic style! Everyone stopped talking and laughing and concentrated intensely on devouring the sumptuous gastronomic wonders laid before us. We were so full that we actually felt drowsy! We call this phenomenon “Sakit sa Baboy,” or “Pig Syndrome.” hehe! After letting the food settle in, we cruised to our next destination just 15 minutes away, a place called Matinloc Shrine, an abandoned pilgrimage site. Although abandoned and completely neglected, tourists are still allowed to visit the shrine. Thus, a concrete pier was provided for boats to dock. Matinloc Shrine, formally known as the Shrine of Our Lady of Matinloc, was inaugurated and blessed on May 1993. To date, many locals still travel to this abandoned shrine to honor the Lady. There is also an abandoned villa beside the shrine. 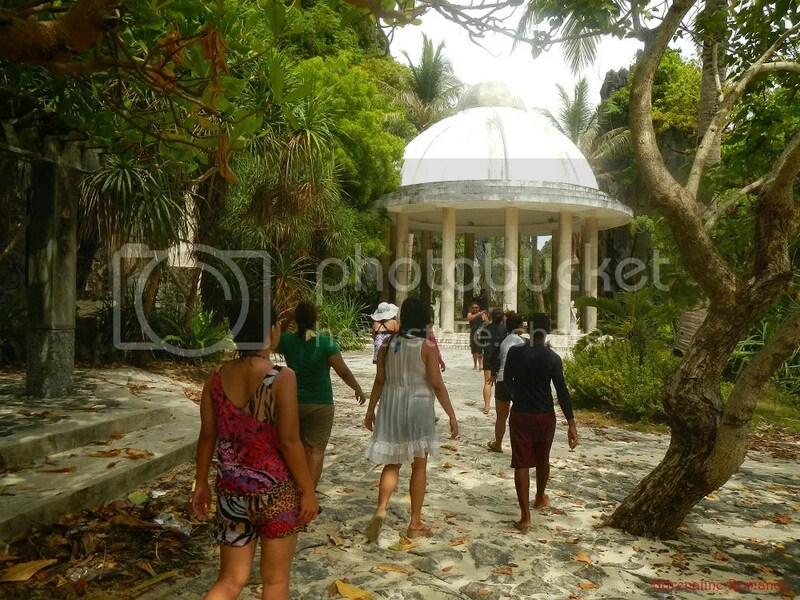 Owned by a religious local named Jablon Fernandez, the villa was supposed to be a lodging facility for pilgrims. Apparently, it was abandoned before it could even house the first pilgrims. There is a small “museum” which shows the history of Matinloc Shrine. It’s kind of strange that there’s a museum in this isolated, remote island. 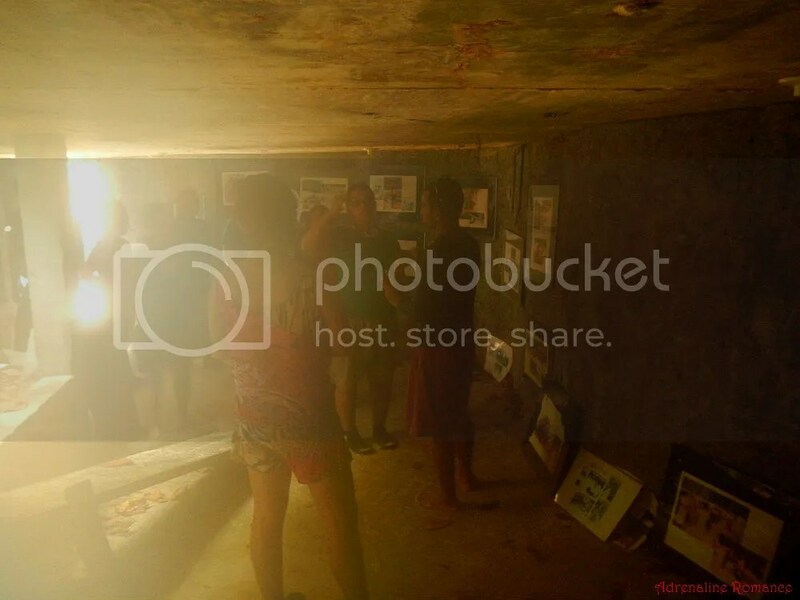 Inside the museum are photos and newspaper clippings that explain the history of Matinloc Shrine, how it was built, and the miracles that supposedly occurred in the area after the shrine was constructed. For us, the best part of the island is the viewing deck which provides us an all encompassing view of the Matinloc channel. To reach it, we had to climb several steps that were carved into the rock. 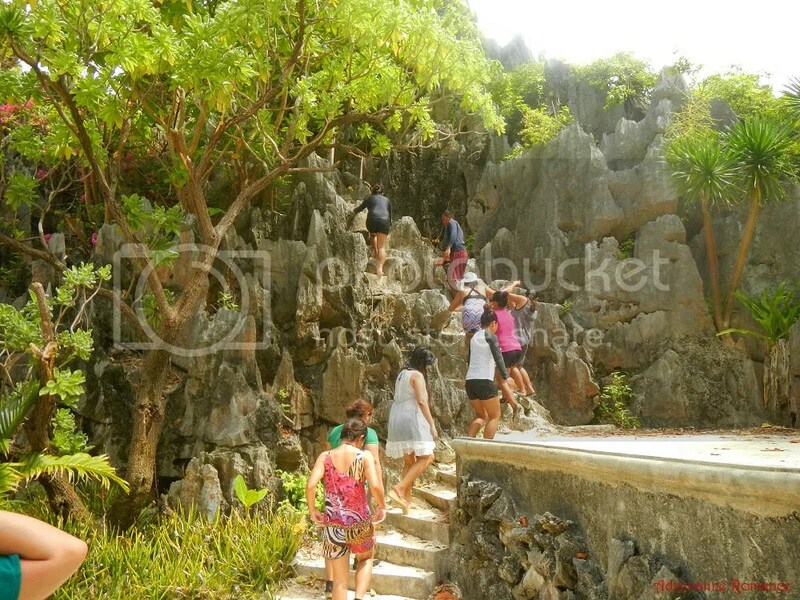 Climbing the rock steps is relatively safe, but you still need to be careful since the rocks are quite sharp and the sides are quite steep. After a couple of minutes or so, we reached the viewing deck, which is bordered by sharp, towering limestone rock faces. The rock face is climbable due to its sharp ledges and eroded holes, but that would be at the climber’s own risk. Wow! 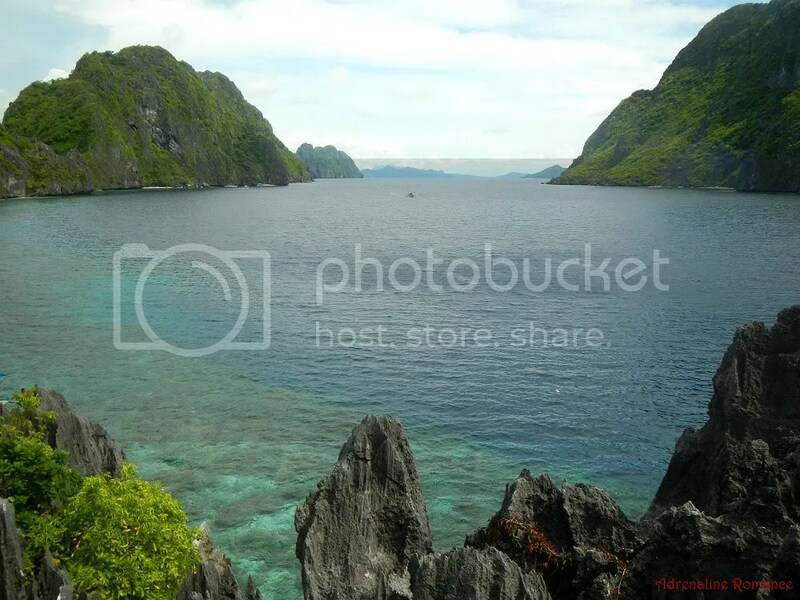 Just look at that awe-inspiring view of the Matinloc channel! And we just scratched the surface! 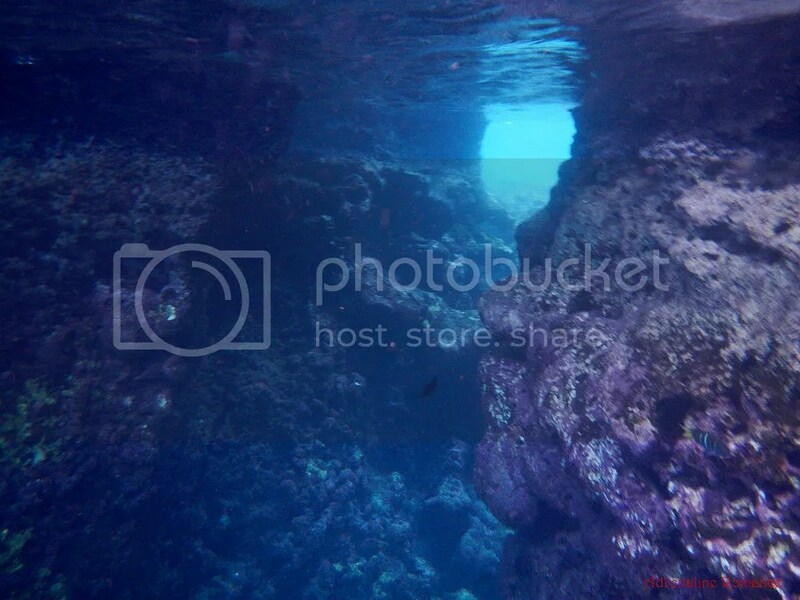 Underneath that aquamarine water is another alien world full of wonders seen only by a few. Then it was time to visit amazing beaches! Beautiful photos and great information. This is definitely on our bucket list. I’ve been to Matinloc twice but never knew there was a mini museum. Can you tell me about its history and the miracles? Thanks. Yes, there is a museum at the left side of the shrine. It’s well hidden. With regards to your question about its history and miracles, we didn’t read everything that was displayed on the framed newspaper clippings; we got the info from the guide. But we do remember one so-called miracle; according to an old framed article, many years ago, fishermen near the area got a huge catch of fish even though it was not fishing season. And you’ve got a very good reason to be excited! 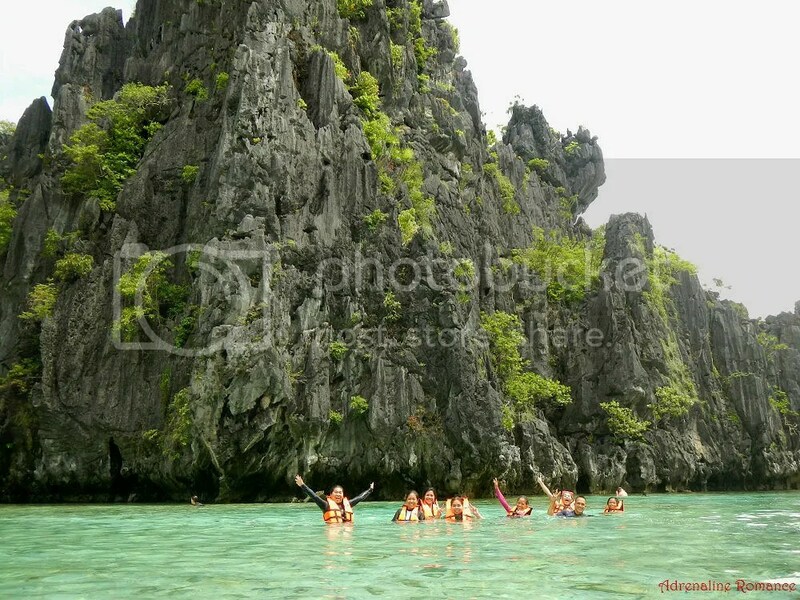 El Nido is absolutely spectacular! You can contact us by clicking the Contact Us page at the top menu of this website. 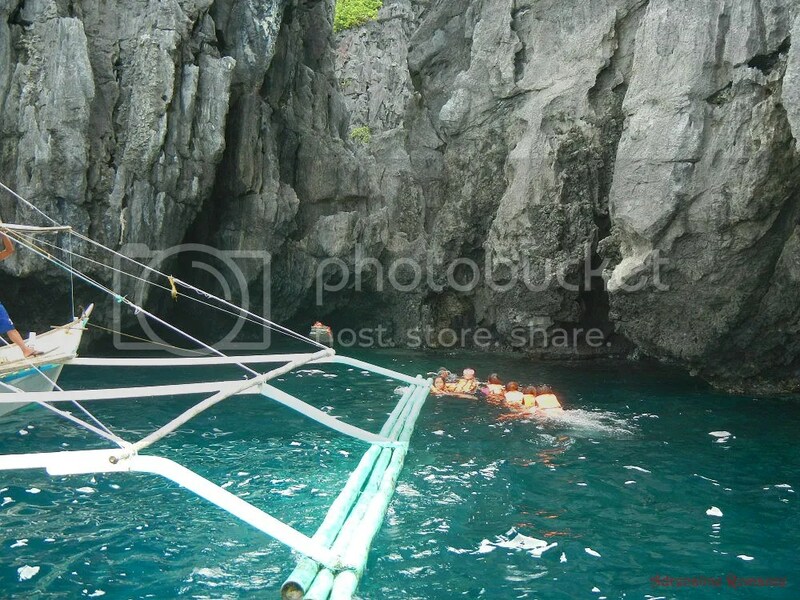 We’ll see how we can help you with your Palawan adventure. Thank you! Hi! I love all your pictures. 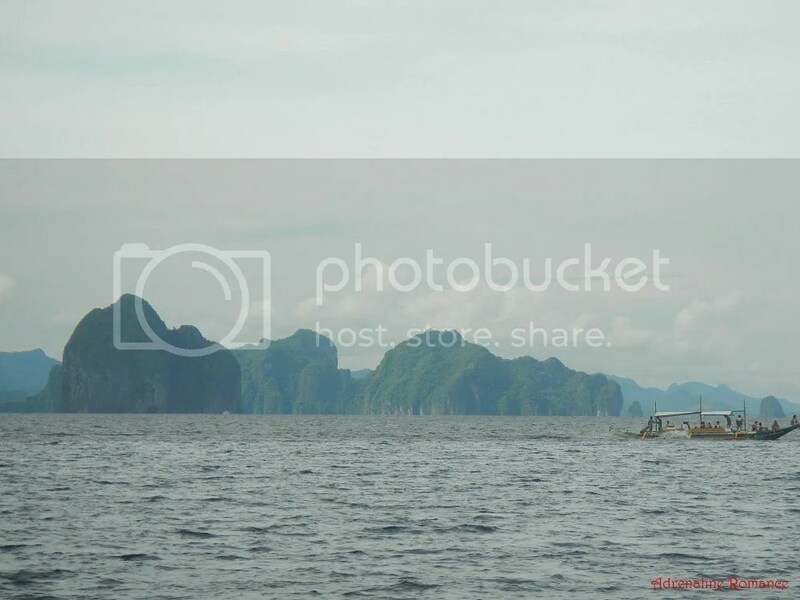 What camera did you use here?I’m planning to buy underwater camera for our el nido trip on May 2015. Thanks. Thank you for the compliment! We used a Nikon AW100 Coolpix waterproof camera. It takes very good photos. However, after a year of using it underwater, it conked out of us. We found out that water still seeped in despite its waterproof capabilities. Thankfully, it got “resurrected” after a camera specialist fixed it, but it can never be submerged again. If you want an underwater camera, we recommend buying one with an underwater casing (such as a GoPro). According to the specialist, all electronic equipment, even if they’re advertised as submersible, will eventually let water in as their gaskets and lining wear out. To make it truly submersible, it needs to be enclosed in an underwater casing. I did this tour on Sunday and it was amazing. Great pics! Thank you very much! Were you able to go inside Secret Beach? Thanks for your comment and inquiry. Regarding your inquiry, our accommodation provider, Mylene of Victoria Guest House and Cottages gladly booked our tour for us. You can check out her contact details by clicking here and scrolling to the Tips section. 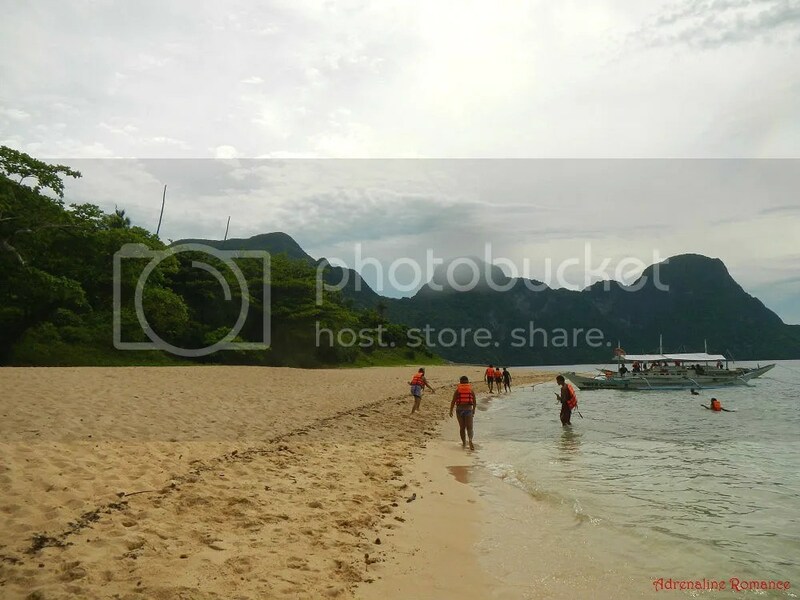 Nice pics and yes the snorkeling there is quite good… But I actually felt let down there after the snorkeling around Bohol, camiguin and even Samal islands are far better than this. I just wanted to say that yes its good, but its nowhere near the best in the Philippines. 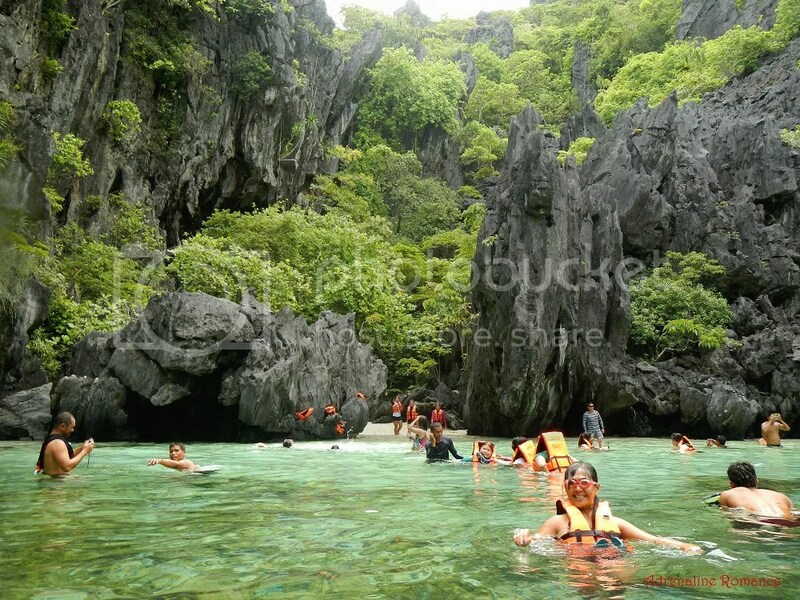 Also, Bacuit Bay/El Nido is known for its secluded islands, sandy beaches, towering rock islands, karst formations, and majestic lagoons. 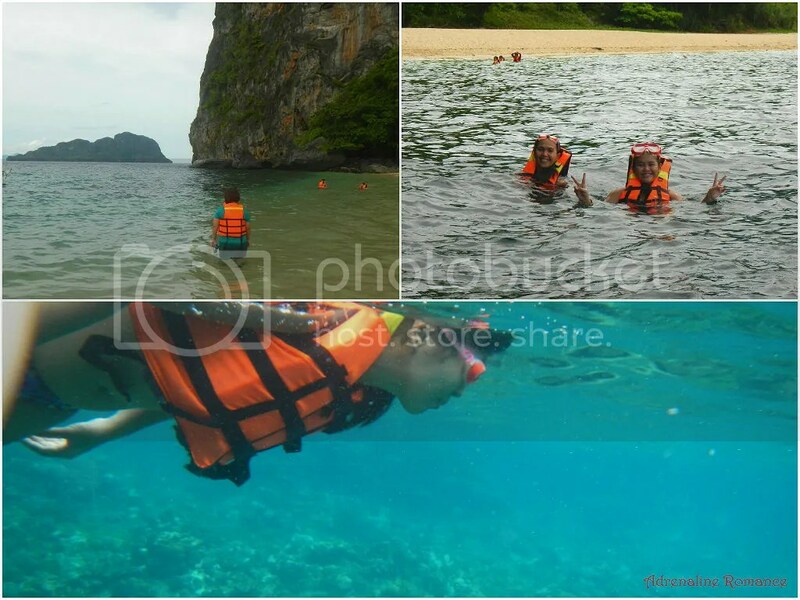 It’s not really a known as a snorkeling or diving destination although there are good spots for diving. Thanks for sharing this. Can you share ate helen’s contact number? Thanks! Victoria Guest House and Cottages in Puerto Princesa where we stayed in was the entity that assigned Helen to us. 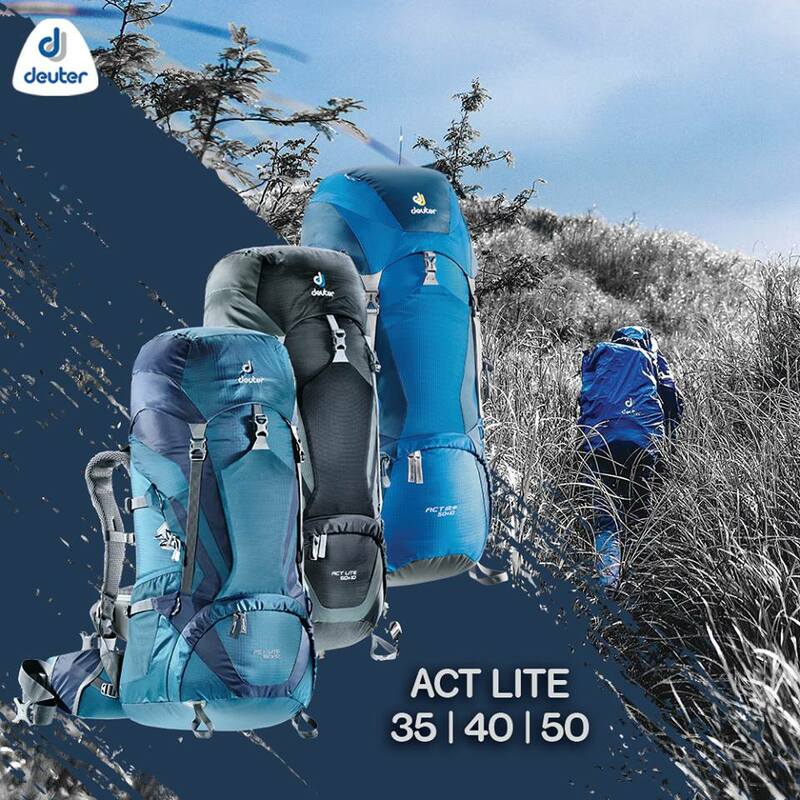 Contact details are in this link. Scroll down to the Tips section. Thank you very much for the compliment. 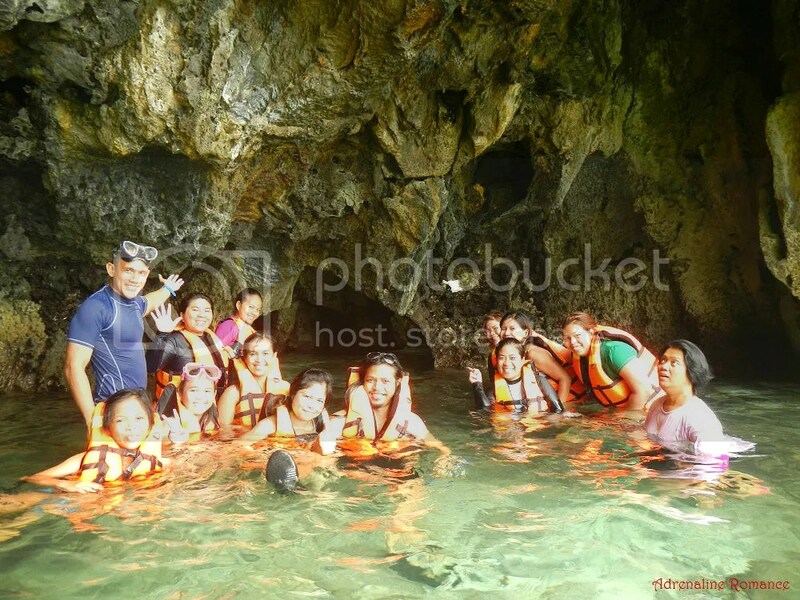 We’re happy to know that you’re going to visit one of our country’s beautiful destinations. Regarding your question, each tour is designed for efficiency. In other words, the islands in Tour A (or B, C, D) are near each other. We really can’t give you an answer since we visited all the islands in each tour package. However, using the premise above, it may be possible to request your boatman to visit specific islands that are included within your selected tour package. But you may not be able to visit an island that is outside your chosen package. 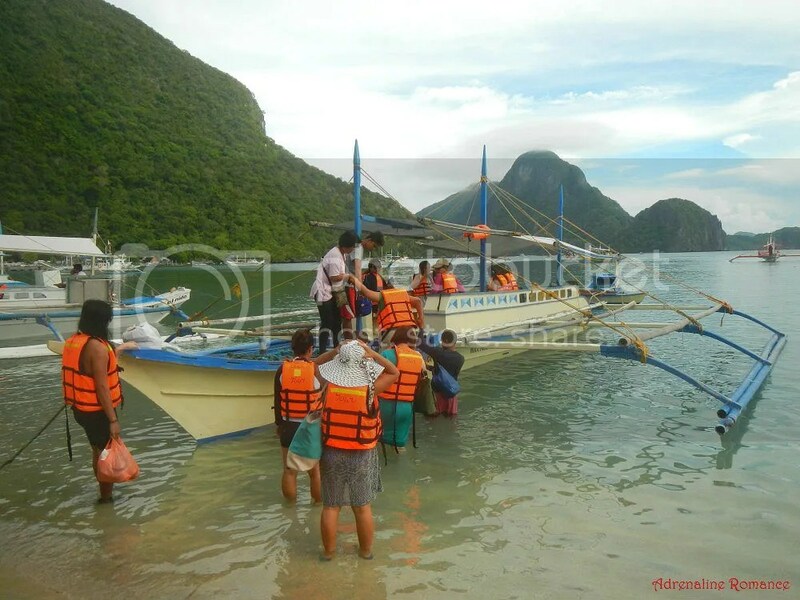 We strongly suggest your service provider or the tourism office in El Nido if they can customize a trip for you in which you can visit specific islands. We haven’t tried that, but it may be possible. That’s really great! 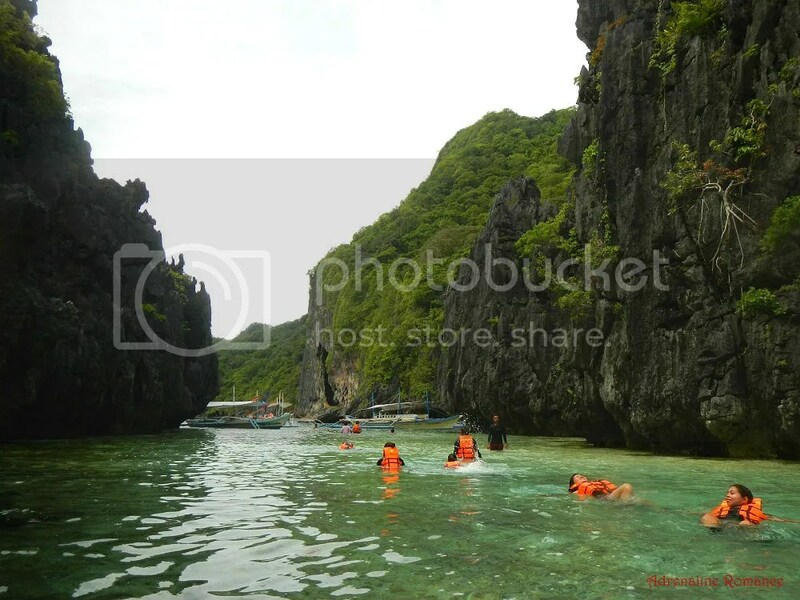 We are actually planning to go back to El Nido and check out the dive sites there.